Is boat cleaner wax really different than boat wax? Before you spend hours searching the internet for a top rated boat wax, it will be necessary for you to understand the nature of the beast. And in the case of boats, the beast is gelcoat! While many people refer boat care as fiberglass, the reality is that fiberglass is actually the fiberglass cloth used to construct boats with, but gelcoat is the actual top layer to a boat and the layer we will be addressing when it comes to boat waxing, polishing, or in this case, finding a top rated boat cleaner wax. 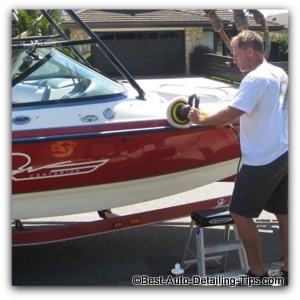 There are essentially (3) steps or levels to boat care when it comes to waxing, cleaning (cleaning is not washing), and polishing. Most people at best will separate the subject down to (2) categories: waxing and polishing. The industry has responded with boats just as they have done with cars for a very long time, and make one-step cleaner waxes designed for use on boats to remove mild to moderate levels of oxidation. With one-step boat cleaner wax you can remove the oxidation, restore some shine, while laying down a layer of protection. "Most people do not understand the differences between polishing, cleaning, and waxing a boat and therefore get marginal results and set themselves up for disappointment. Understanding the difference will help you use the correct product and get better results!" This page is dedicated to boat cleaner waxes and therefore I only add this section to broaden your understanding and help you make more informed decisions. 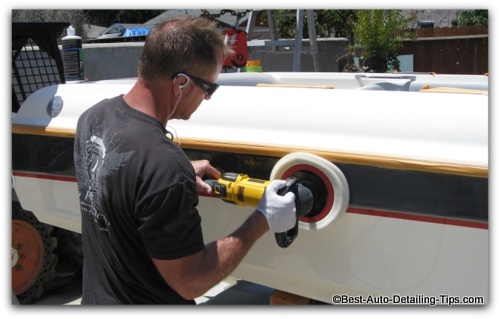 Waxing your boat is strictly for protection and visual enhancement. Trying to use a wax or sealant on a boat with any form of oxidation will be a frustrating exercise. If you even begin to question as to whether your boat has any oxidation, the answer is probably yes and you should skip to the next sections regarding boat cleaner waxes or boat polishing. If you can answer yes to the following bullet points, then you can go directly to best boat waxes and shop amongst the top-rated boat waxes. Your boat is a brand new custom ordered boat that has virtually never been exposed to prolong sun. Your boat has just been bought used and the previous owner stored the boat indoors and is in pristine condition. Virtually every industry responds to consumer demands by formulating multi-purpose, all-in-one, or one-step products that are designed to accomplish multiple tasks or duties; the marine industry is no exception and therefore we have what are known as cleaner waxes. The ability to clean, or remove, mild to moderate levels of oxidation while adding a layer of protection. Boats are big, get dirty, are subject to harsh conditions, and therefore most people fail to perform the basic requirements of care and maintenance when it comes to the beauty and protection of the exterior surfaces. which just means that oxidation will be a reality for most boat owners! Use any of the secure links below to shop among the top rated boat cleaner waxes. Meguiar's M5032 Marine/RV One Step Cleaner Wax - Liquid - 32 oz. 3M 09005 Marine Restorer & Wax, 16 oz. Darren's Professional Tips: When it comes to shopping for a dedicated one-step cleaner wax for your boat, this is an area that doesn't have to be over thought. Any of the above products will produce great results as far as boat cleaner waxes go, and so long as the oxidation is at a minimum. If you are new to the world of boat ownership, as a rule, every boat will have some form of oxidation. Unless your boat is brand new, and never been kept outdoors for ANY length of time, I would always recommend a cleaner wax as your first "go-to" boat wax. Even the most well kept boats will have even a subtle amount of oxidation that will reveal itself the moment you try and wax your boat with wax-only type of product. Use with a damp rag; either a micro-fiber or terry cloth rag. Rotate the cloth as it becomes saturated with the boat cleaner wax/oxidation. Don't think that the more the rag becomes saturated the better it is going to work. Multiple applications are better than trying to apply too much cleaner wax and getting it in a single step. Avoid slopping the cleaner wax into tight seams and crevices. It is easy to get overly zealous and start attacking the boat in attempt to get the job done! Carelessly slopping the product around will only create additional work and disappointment later! You realize weeks down the road you have excessive wax that has now dried to a chalky haze in all the seams and crevices around your boat that you must now try to figure out how to remove. 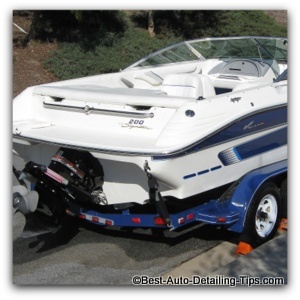 If you have higher expectations for you and your boat, and your spider-senses are telling you that a one-step cleaner wax applied by hand is not going to deliver the level of results you are after, then your next step is a dedicated gelcoat/fiberglass polish used along with a professional grade boat polisher. Because gelcoat is such a tough and durable material, the good news is that this makes for an ideal way for beginners to learn and use high-speed polishers. The additional good news is that high-speed polishers are more user friendly than ever and even true beginners can realistically use them and get professional results...so long as you give yourself a fighting chance and arm yourself with the right equipment and products. You can go to fiberglass boat restoration and see the complete boat polishing kits available that promise to produce professional grade results. "Darren I am torn! I am pretty certain my boat has some oxidation to it, especially on the top surfaces. But I can't decide whether I should try a simple boat cleaner wax or a dedicated boat polish?" Let me just say, "You are not alone!" The simple answer as a general rule is to start simple, and go from there; which would mean one of the top performing cleaner waxes from above. But this probably won't go very far in helping you make a decision. You are a simple person with modest expectations. 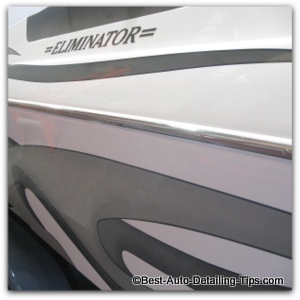 You know if you can add just a little shine to your boat you will be a happy camper (or boater). You don't feel like spending a bunch of money but don't mind applying a healthy level of elbow grease to use a one-step cleaner wax for your boat. You are looking for the best results possible. You are into your boat for the long haul and really want to raise the bar on its appearance and protection. You have always wanted to learn how to use a high speed polisher. You are self reliant and industrious by nature, and don't mind getting your hands dirty and learning something new in the process. If you have decided you want to take it to the next level and would like to see how the industry has responded with some professional grade equipment and products, then go to fiberglass boat restoration and see how even beginners can expect to produce professional results. Hopefully the information on this page has opened your eyes to where you are now seeing things a little more clearer. This topic is a big topic to cover, but you should be able to make a more informed decision at this point in chossing the most appropriate wax for your boat.